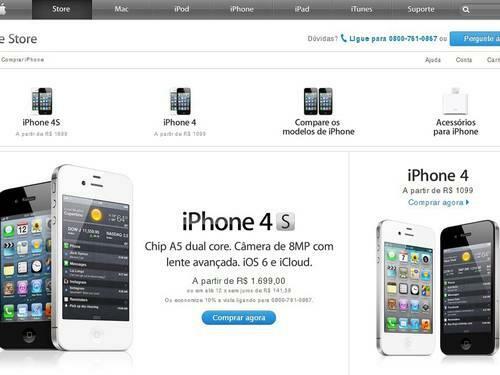 The price cut saw both handsets' prices cut by R$ 400 ($198), as Journal O Globo noted (via Mac Rumors) on Monday. Pricing for the iPhone 4 now starts at $544 for an 8GB model, while the iPhone 4S starts at $840 for a 16GB model. Apple sells the iPhone 4 unlocked and unsubsidized for $450 in the United States, and the iPhone 4S for $549. As in China, Apple offers iPhone buyers the option to pay for their devices in monthly installments. Brazilian customers also have the option of paying for their iPhones in full up-front, thereby receiving an additional 10 percent discount. Jornal O Globo's report notes that Apple has confirmed that the price drop is not a limited time promotion, and that these are instead the new starting price points for the handsets in Apple's official store. The iPhone 5 is still being sold without a discount. The discount puts Apple's two lower-priced smartphone options better in line with pricing on competitors' phones. Samsung's Galaxy S II costs R$ 1,599 in Brazil, while Motorola's Razr sells for R$ 1,299. The price cut may stem in part from Apple's increased Brazilian operations. Apple partner Foxconn has been assembling iPhones in Brazil for more than a year, though initially the local assembly of the devices had no effect on their pricing in the country. As South America's largest economy, Brazil is an important economy for Apple, even though some legal issues have presented minor stumbling blocks in the country. The iPhone maker appears close to resolving a trademark issue and gaining exclusive control over the iPhone brand in Brazil. Meanwhile, a Brazilian consumer protection group recently filed suit against Apple, claiming that the company's new fourth-generation iPad was an example of "planned obsolescence" since it followed so quickly after the third-generation model.